The Georgian is an attractive corner summerhouse available in three sizes and with the smallest model measuring just 6' by 6' it's suitable for even the most compact garden. The building itself is finished in quality wood with georgian styled double doors and top hinged windows. Light and airy with plenty of glazing the Georgian corner summerhouse would be a valuable addition to any garden. Standard construction is 12mm shiplap cladding on a frame of 44 x 34 chamfered eased red wood. Upgrades to to both cladding and framing are available as detailed below. The door hinges and handle are of ornate antique design and for security the summerhouse is fitted with a lever lock. The Georgian is available in three sizes; 6' x 6' (1.83 x 1.83m), 7' x 7' (2.14 x 2.14m) and 8' x 8' (2.44 x 2.44m). Each model is 6'4'' (1.94m) high at the eaves rising to 7' (2.15m) at the ridge. The summerhouse comes ready dipped in a water based wood treatment and will need finished with an appropriate wood finish following delivery. Upgrades are available to 18mm premier shiplap cladding, 15mm loglap cladding, 18mm floorboards, 44x44 framing and toughened glass. In addition felt options are available for the roof. 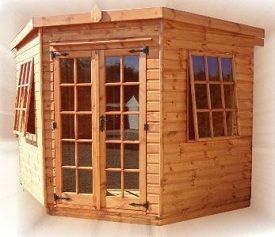 The summerhouse is supplied ready for straighforward diy assembly with basic equipment. An installation service is available at extra cost in certain areas. If you own a Georgian Corner Summerhouse we'd be delighted if you'd submit a review to help other prospective customers. You can do this on our Corner Summerhouse Review Form - we look forward to hearing from you.